S Strings are recognised as one of the UK’s top entertainment acts. Graduates of the Royal Academy and Royal College of Music in London, they have been attracting worldwide attention following stunning performances in Germany, France, Italy, Korea, Greece, Ireland, Spain, Portugal and Dubai. S Strings perform their unique show on electric instruments. The quartet (including the cellist) appear standing up using exciting choreography as they play and interact with the audience. Depending on the venue, they are also able to move through the front of the audience during the show. The programme consists of a number of popular tracks from crossover classics and Irish to pop. For the electric show S Strings use backing tracks with especially pre-recorded drums and guitars, giving the show an incredible energy and drive. In addition to the electric show, they can be booked to play a background classical set on acoustic instruments. In the past year the girls have performed their show at Wembley Stadium, Ricoh Arena, Liverpool Arena and Cardiff International Arena and the opening and closing shows for the Professional European Golf Championships on the Island of Cheju in South Korea. They have also been the support act to Rod Stewart, Natalie Imbruglia, performed at the Excite Awards supporting Girls Aloud, the La Dolce Vita Ball in London supporting Javine and Billy Ocean and at ICC in Birmingham sharing the headline slot with Myleene Klass. They recently appeared as soloists with the Manchester Camerata Orchestra. They have featured on many TV shows including BBC1s Later With Jools Holland, Jonathan Ross, Live At Abbey Road, Channel 4s T4 Special and BBC Radio 1. 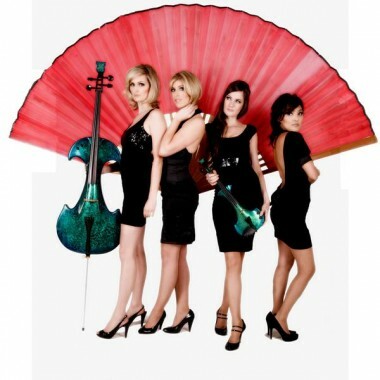 S Strings were the featured string quartet on two European tours with Gnarls Barkley and appeared with the band on Top of the Pops with their no 1 hit Crazy. They have also performed with P Diddy at Wembley Stadium, with Alfie Boe on Parkinson, Mika at Brixton Academy, Mutya, Michael Buble and Hard Fi, featured as the strings in Mark Ronson’s video Valerie and recorded with The Killers, Brand New Heavies and Dutch X factor winner Lisa Hordijk. They have also completed a European tour as part of Simply Red’s string section and performed in all of the major venues in the UK and much of Europe. The group’s members have played with artists ranging from Kanye West and Gorillaz to Jay-Z, Take That and Dame Shirley Bassey. As classical players they have worked with Sir Yehudi Menuhin, Sir Colin Davies, Maxim Vengerov and Vladimir Ashkenazy, with the BBC Symphony Orchestra, London Symphony Orchestra, London Metropolitan Orchestra and Ulster Orchestra, and have performed in the Royal Albert Hall, Queen Elizabeth Hall, Royal Festival Hall and Barbican in London and in concert halls of over 20 cities throughout the world. S Strings also sing, including well known tracks by a number of contemporary pop artists. This makes them unique as a quartet. They have worked as backing vocalists for Alison Moyet on tour, sung on adverts for Nokia and Specsavers and worked with producers Rose and Foster (S Club, Kylie) and Richard Taylor.